Main Features: 3 player modes (full, baby and resizable stick), playlist stick mode, 20 funky "pinball styled" visualizations, sliding drawer including equalizer, configuration page and letting you chose from about 70 color themes (including themes by 883, Blueballs, Frezorer, Merci Oner and the T-K brothers), user friendly interface, all components windows skinned, many exclusive options (find more about them with the included "skin tips" window). Hope you’ll enjoy playing with it as much as we did when we made it. Happy downloading! 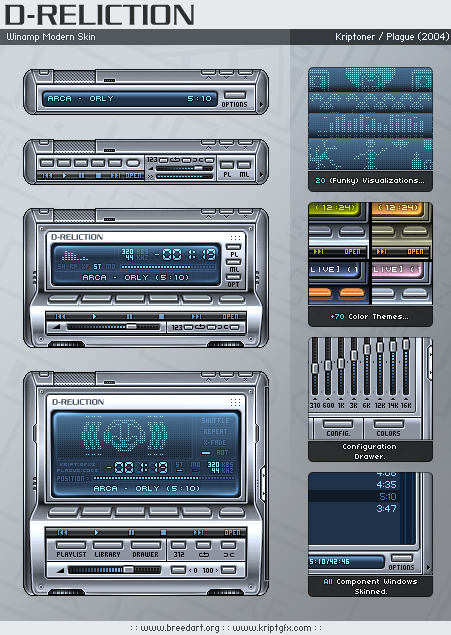 This would be one of the nicest winamp skins I've ever seen! I've been waiting for this ever since I saw the previews on devart and winamp. great work. glad to see breed represented in the competition. good luck on the judging. This is really freakin sweet. Great work guys! And btw, if any of you guys would happen to use wasabi.player instead, I have a version of D-Reliction for that aswell. Just e-mail me and I'll send it, as I won't upload it anywhere due to this competition. This one is meant to be the winner. It's not about who you know anymore. They can't give it to anyone else. ...when it looks like this. They doesnt get any better than this! I've been using it for some hours now.... still finding new features/buttons/knobs to "play with". I agree with those previous comments that state that this is a sure winner! awesome, and great creativaty is appreciated. question?, i know you stated this works with v5.03, but are there plans to incorporate the new winshade docking feature? er nvm i guess it does when the right mode is chosen sorry my mistake. and now i have to agree this is the current pick for winamp winner. it even looks good at high resolution desktop's when scaled to 150% unlike some other skins i have seen for the modern winamp. Wow! This is the best Winamp skin I've seen since MMD3. Congrats on the hard work...best of luck in the competition. Simple clean gfx on it, makes it look like a real device. I'm in shock, what quality, what a gorgeous skin, a true winner in all respects.